Imladris was Elrond's home in a valley of the Misty Mountains. Imladris means 'Deep Dale of the Cleft.' (Silmarillion 368) It was also called Rivendell and 'the Last Homely Home. Fangorn or 'beard of tree' was the great forest ruled over by Treebeard, though ‘managed’ is a better word than ‘ruled over.’ (TTT 63-70) It lay on the borders of Rohan. Rohan was the land of the Rohirrim. 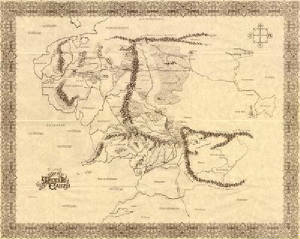 It was given to them by Gondor after Eorl the Young and his men saved Minas Tirith. 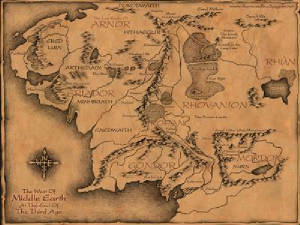 It was in the south-western part of Gondor. Edoras: Edoras was the city of the Rohirrim and the seat of the Kings of Rohan. It was built on a hill in the middle of a plain. It contained Meduseld, the Golden Hall. Tolkien, J.R.R. The Return of the King. New York: Ballantine Books, 1956.